« Zillow buys Trulia, how does this affect the game? I think there are quite a number of things that add to quality of life, and staying active and fit is one of them. For some that may involve aerobics, weights, walking, running, swimming, any number of activities. The greater your options, the greater the odds are that you’ll stay active, and tennis is a great option. The City of Lake Oswego offers indoor and outdoor tennis options. Outdoor tennis is found in 7 locations, 2 of which have lighting for evening use. These courts are first-come, first-serve with the exception of the courts that are located on school property. Use at those locations is affected by school use as well. But they are pretty simple to use and easy to find. For a list of locations, click here. 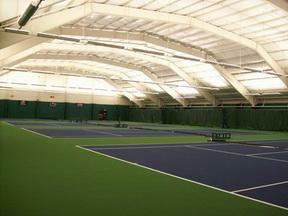 The indoor courts can be found at the Tennis Center at 2900 Diane Drive in Springbrook Park. Open daily from 6:00am to 9:00pm, courts are available on an hourly basis for $18 per hour. Reservations can be made up to a week in advance. For convenience you can buy lump sum packages (still at $18 an hour). In July there is a lottery for up to 4.5 months of advance reservations in September to May. The indoor facility has four courts. There are a wide variety of activities for all ages, and all abilities: general use, lessons, competitions, youth tennis, it’s very impressive. Of special note, the Lake Oswego Tennis Center, with sponsorship from the Greater Portland Tennis Council, provides the only Special Olympics tennis program in the State of Oregon. Also, be aware for about 2 weeks each summer the facility is closed for maintenance. Last year the 2 weeks were in August.